So far Brad has created 11 blog entries. Join us Sunday March 29th from 10-12:00 at the South LA Shelter to celebrate the Shelter Intervention Program’s second anniversary. Since April 6, 2013, more than 4600 pets have been prevented from shelters by asking pet owners,”How can we help?” Bring a collar, leash, a bag or cat or dog food to support a pet in need. We are also celebrating DDR founder Lori’s 50th Birthday. Today we lost one of our old DDR dogs, we lost Big Petey Boy. A blind 17 year old dog, who just this morning, had his normal spring to his step and ate a hearty breakfast, but later in the day, we knew something was wrong. Pete had two tumor removal surgeries within the last five years, some of the tumors had come back and he was no longer a candidate for surgery. He died peacefully, sleeping on his favorite blanket on his Kurunda bed around 4:00 this afternoon. I’d like to think that it was time for me to give him back to his daddy, pictured above, in happy days, before Vietnam Vet Steven passed away and left me Petey in his will. At the time I did not know the gift that I received. Come out and meet the DDR adoptable dogs: Cookie, Buffy, Joey and new dog Stevie this Saturday 10Am to 1PM at Garfield Park in South Pasadena. We want to say thank you to everyone who donated $1500 so South LA Shelter Intervention dog Tomas could have the first of two life saving surgeries. It will be a long road to recovery before this sweet little dog can go back to his family, but he is doing well. First he had to have the dead skin removed. He will be in the animal hospital, being bandaged and medicated so the skin can heal. His second surgery will happen once the skin is ready to close. Right now, the wound can’t be surgical closed, The animal hospital has donated so much of the “real cost” $1500 would not even begin to cover the actual cost of the two surgeries and the long medical boarding care. Tomas’ family is so grateful for the generosity of all of you who donated keeping another dog out of the shelter and in his loving home. Here is a video that explains the process. DDR X The Rescue Train X LAAS = More Lives Saved! Saturday February 14th was the launch date of a new program for DDR and our partner The Rescue Train. 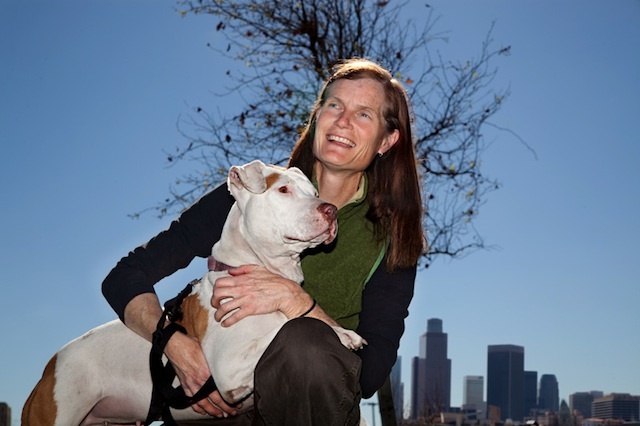 Based on the success of our South LA Shelter Intervention Program, LA Animal Services (LAAS) agreed to allow us to start a pilot program at the East Valley Shelter. The program will run the same way our program at South LA runs. Shelter staff members at intake will identify pet owners who are looking for an alternative to surrendering their cat, dog, rabbit to the shelter. Our counselor Maddy will offer a variety of services to assist more families in the East Valley keep their pets. Some of the services we will offer are medical assistance, humane euthanasia, dog training, repair of fences/gates, installing dog runs, paying for dog licneses and free spay/neuter + vaccines as just some of the many services that we offer to families in need who have pets. We also offer to assist pet owners with redemptions, which reunite pet owners with their pets that are in the shelter but they can’t afford to get them out. Think of all the pets that are in the shelter that have an owner but the owner can’t afford to get the pet back. Imagine a day we could send them all back home. Pug was one of those dogs. The fees to redeem Pug were $147. Pug, a one eyed, senior dog who had a senior owner living on a fixed income with only $60. DDR paid the balance and another dog went back home. Our total for our first day was 5 cases. While we will be there just one day a week, our goal is to continue our partnership with The Rescue Train, who is learning how the program runs, and turn the program over to them to run 2-3 days a week by June! The Rescue Train understands that there are lots of families who need help, that need additional resources, that need more information so they can keep their pets. Like our Facebook Page and read our stories of success on this program and more! Help us find Rudy his forever home! Rudy is a sweet puppy who is available to adopt. He is doing great in his foster home with other dogs, loves to come and spend Sunday afternoons at the DDR kennel, playing with a bunch of dogs. Some of Rudy’s favorite past times, other than playing, sleeping, dreaming and eating. YES he is a couch potato puppy! Adopt the love of your life on Saturday February 14th Downtown Dog Rescue dogs will be available at a special adoption event at a great new shop in Highland Park called Rosie Bunny Bean. Stop by and say Hi! Now through March, Yellow Brick Home Blog is donating a portion of all sales for pet portraits. These are AMAZING portraits that you will cherish forever.